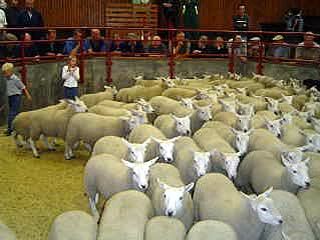 The Cumberland & Dumfriesshire Farmers Mart PLC had forward 366 ewes and lambs at their weekly sale at Longtown on Tuesday 30th June, 2009. Trade was still dear for a smaller entry. Ewes sold to a top of £52 for Greyfaces with singles from Murraythwaite; Texel £48 Glasson; Roussin £40 Haithwaite; Hill Cheviot £40 Haithwaite, £38 Over Cassock; Blackface £37 Over Cassock, £36 Haithwaite. Ewes with twins to £44 for Zwartbles from Mossband House; Greyface £43.50 Murraythwaite; Jacob £40 Mossband House; Blackface £34 Over Cassock. Hoggs with singles to £56 for Texels from Highrigg; Suffolk £51 Highrigg. Suffolk hoggs with twins £40 Highrigg. Cast ewes to £50 Mossband House.